Clayton, N.Y. - Michael Folsom, organizer of Sailing Seaway Clayton presented by Casinkette&apos;s Lofink Ford, has announced that visiting tall ship Fair Jeanne will be available to local school groups for complimentary deck tours. 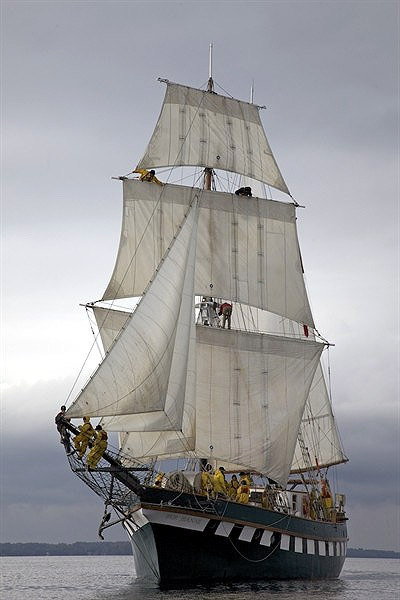 Fair Jeanne, a 110-foot sail training vessel based out of Canada, will be the highlighted tall ship of the 2012 edition of Sailing Seaway Clayton presented by Caskinette&apos;s Lofink Ford, which will take place June 14 through June 17 in downtown Clayton. As part of the ship&apos;s scheduled appearance, school groups are invited to visit the ship at the Thousand Islands Regional Dock, free of charge, on Friday, June 15 between 9:30 and 11:30 a.m. "The folks at Bytown Brigantine, operators of the ship, understand the importance of educating children," said Folsom. "Their outstanding crew and staff will be sure to engage with those children that visit the ship and ensure they leave with a better understanding of sailing and life on the water." The second-annual festival officially kicks-off on the evening of Thursday, June 14. A number of antique boats from the Antique Boat Museum, along with Clayton&apos;s fireboat Last Chance will take part in the Grand Arrival of tall ship Fair Jeanne around 6 p.m. Those school groups looking to visit the ship should email their school name, potential number of students and contact information to theshipwatcher@yahoo.com. For more information on Sailing Seaway Clayton presented by Caskinette&apos;s Lofink Ford, be sure to visit http://www.sailingseawayclayton.com/.